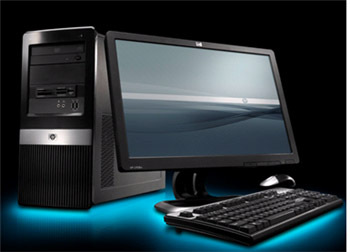 Processor Intel Core 2 Duo processors, Intel Pentium dual-core processors, Intel Celeron processors. NOTE: For systems configured with more than 3 GB of memory and a 32-bit operating system, all memory may not be available due to system resource requirements. Addressing memory above 4 GB requires a 64-bit operating system. NOTE: Any two of the above hard drives are supported. Removable media supported SATA DVD-ROM drive, SATA CD-RW/DVD-ROM Combo Drive, SATA SuperMulti LightScribe4 DVD Writer Drive, 1.44MB diskette drive, HP 16-in-1 Media Reader and additional USB 2.0 port . Expansion bays Five (5) bays total: Two (2) 5.25-inch and one (1) 3.5-inch external drive bays and two (2) 3.5-inch internal drive bays. HP ADD2 SDVO PCIe x16 DVI-D Adapter – optional, ATI Radeon HD 2400XT (256MB DH) PCIe x16 – optional. Audio Realtek ALC662 High Definition audio codec, 3D audio compliant and HD Audio compatible. Communications Integrated Realtek 8101E 10/100 Ethernet Controller, Intel PRO/1000 PT Gigabit PCIe Controller (full height) (optional), Agere 56K PCI Modem (optional), HP Wireless A+G PCI Card (full height) (optional). I/O ports and connectors Eight (8) USB 2.0 ports; Two (2) front ports, four (4) rear ports, two (2) internal ports on motherboard, two (2) PS/2, one (1) RJ-45, one (1) VGA, one (1) audio in, one (1) audio out, one (1) MIC. Input devices Standard PS/2 or USB keyboard; PS/2 or USB 2-button optical scroll mouse, or USB 2-button laser mouse. Power 250-watt ATX Power Supply – PFC/non-PFC with a 115v/230v line switch (varies by country/region).